In this first test I have used CrystalDiskMark 3.0.2 to test raw sequential read and write performance over a gigabit network. From my test machine I mounted the Crucial M4 SSD (with letter Z:) and the 2TB WD Caviar Green (with letter Y:). This PC is networked with 10 meters long Cat 5e network cables. 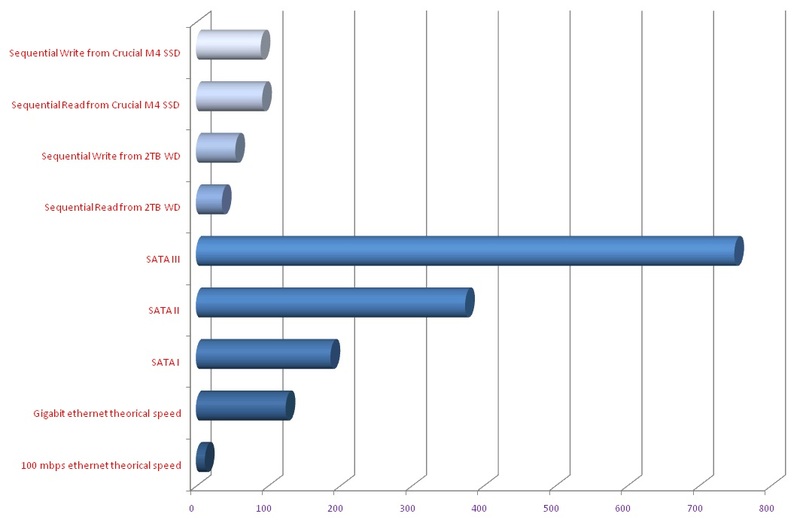 As you can see there is clear difference in performance between an SSD and a 'legacy' HDD. While the performance of the SSD is limited only by the Gigabit network (90 MB/s), the mechanical HDD is limited by its capacity to sustain 64-Kb reads and writes. That's all for this first post on the performance of my NAS. I'll delve into more detailed benchmarks in forthcoming posts and I'll also test these hard drives without using the network. I'all also see how my configuration can be tuned to deliver faster results if possible. In the meantime, do not hesitate to share your own NAS results but remember to detail your build configuration for other to be able to compare! Can you do some speed test with bitlocker activated? I want to build a nas with the same processor and would be curious to see how it handles encryption.